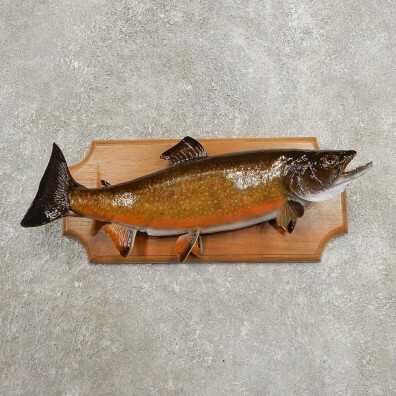 This is a terrific Brook Trout fish taxidermy mount, mounted to a beautiful wood plaque and posed swimming to the viewers right with an open mouth. This great Brook trout measures in at 16.25" long, with a girth of 10" and an estimated live weight of over 2 lbs. The fins, painting, and craftsmanship are all in terrific shape, earning our Excellent Plus™ overall quality rating. All applicable dimensions are included to help ensure this item will fit within your intended display space. The Brown Trout is similar in general shape to the salmon, though its coloration is very different. The spine of the fish is dark, the belly a cream color, while the sides are pale and flecked with a variety of red, orange or brown spots. Brown trout found before maturation can be distinguished by their bluish-grey spots, while adult males will also sport a curved lower jaw. The brown trout originate from Europe, but can now be found around the globe in streams and lakes from distribution and programs.